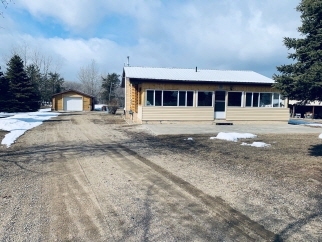 Charming country setting, just 7 minutes outside of city limits off Highway 302 West, 1068' 2 BD, 1 Bath log style home with massive (7.10 x 35') sun room (with glass windows) overlooking picturesque 2.47-acre parcel (directly off pavement). Main floor boats with large mudroom/laundry room, kitchen, dining room, spacious living room, 2 BD's and 4 pc bathroom. High EEF. NG hot water heater. City Water. Septic to mound & holding tank. Single detached garage, two room storage unit with covered deck (with power) and outside covered work area. Single storage shed and playhouse. All appliances included. Situated in private serene subdivision directly off pavement. Move in and enjoy summer in the country!